Daily Express Bingo is not a new online bingo site per se as it was originally part of the Cyberbingo network until they closed in 2011. In April 2013 though the brand reappeared as part of the all new Daily Express Games. Now powered by the G2 Gtech (Spielo) software as part of the St Minver network, they are back with a fresh new look, a wider range of games and plenty of special offers and promotions. When you first visit the site you will land on the Daily Express Games home page where you will be welcomed by Claire Sweeney. From here you can access all of the sub sections using the black and white menu at the top of the page. Click on the 'Bingo' link and you will be taken to Daily Express Bingo. The bingo home page is extremely simplistic with a series of tabs running along the top revealing lists of rooms and games as you click on them. This won't be to everyone's tastes but it looks stylish and makes a real change from the usual page full of flashing banners. Registering for Daily Express Bingo should only take a couple of minutes and you will need to provide them with both a username and a log in name that you will be known by in the rooms. If you just want to get a feel for the place you will only need to enter the most basic details, but if you like what you see and want to wager any real cash you will of course need to enter your credit or debit cards details. Once you have signed up you will be welcomed with some free money as well a deposit bonus but think hard on whether you want to accept these bonus funds as their wagering requirements are higher then usual. 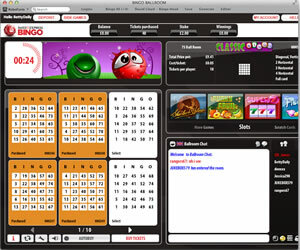 From the bingo lobby you can see all of the important information you need including time until the next game starts, the price of the cards, the number of players taking part and the prize you will be competing for. There are a few rooms to choose from offering 75 ball, 80 ball and 90 ball bingo. All of these rooms continue the black and white theme which is usual for online bingo as they usually favour bright colours; This is most likely to give the impression of a newspaper and therefore tie everything back in to the Daily Express name. The Bingo rooms are all nicely laid out and will feel familiar if you have played at any of the other sites using the same software. To the left the screen you will find all of your cards sitting alongside buttons for auto-buy and useful options such as auto-daub and best card sorting. 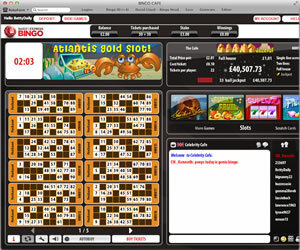 On the right hand side of the screen you will find your chat room as well as a small selection of instant games that can be played without them interfering with your bingo fun. The chat panel itself is quite small but there is a lock facility that can stop it moving to make sure you don't miss out on any useful information or juicy bit of gossip. 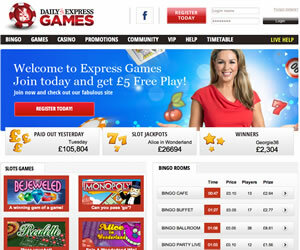 Daily Express Bingo offers the same promotions as all of the other sites on the network but nothing above or beyond that to make them stand out from the crowd. There is free bingo on offer each day between 9am and 9pm as well as a free daily scratch card giving you the chance to win up to £100. Add to this plenty of bargain bingo fun and big guaranteed jackpot games and you have a site that caters to players of all budgets and tastes. The Daily Express is a tabloid newspaper and as such is designed to appeal to the masses. The same can be said for their online bingo site, it is not necessarily doing anything wrong but it lacks that unique selling point that will make you keep you going back for more. 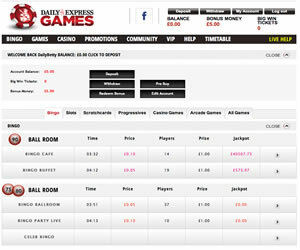 Daily Express Bingo offer three variants of the online bingo game; 75, 80 and 90 ball bingo as well as a wide range of slots, scratchcards, casino games and arcade games..
Before being eligible to withdraw any winnings from Daily Express Bingo you must have deposited at least £20 in your lifetime as a player with the brand. Wagering requirements are 10x the amount of bonus received if you are playing bingo but 25x if you are playing the slot or instant win games available at the site.